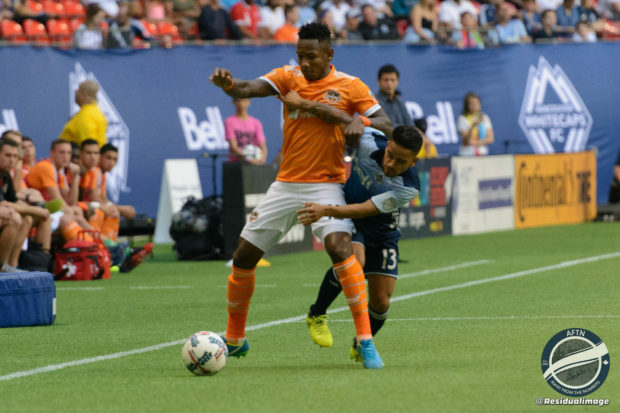 Match Preview: Vancouver Whitecaps v Houston Dynamo – who will counter the counter? After a 2-0 victory over Real Salt Lake, it seemed as though the Whitecaps’ early season woes might have been on the way out. That doesn’t seem to be the case anymore. Supporters were calling for big changes after the 6-0 battering at the hands of Sporting KC. After a 1-0 defeat to 10-men Minnesota United, many are calling for Carl Robinson to get the sack, and sweeping changes to the organization. It’s hard to blame them. With the win, Minnesota United pulled to within a point of the Whitecaps, who are tied with FC Dallas for third in the Western Conference. Sporting KC and Los Angeles FC hold the top two spots by a fair margin, but the clubs beneath them are close behind. Granted, we’re only a little over a quarter of the way into the season, but games where you get 40 minutes to play against a 10-man side are the types of games you absolutely have to win. It isn’t a stretch to say things look bleak. Nevertheless, life goes on, and Carl Robinson is still the manager of Vancouver Whitecaps, at least for now. On Friday, BC Place will welcome Houston Dynamo, a team the Whitecaps have already beaten on the road this season. A loss at home would be devastating, yet a win would do little to soothe the raging supporters. With some fans calling for an end to his time in Vancouver, Carl Robinson will want to set up a dynamic, attacking team at home. Expect to see at least two of Alphonso Davies, Yordy Reyna, and Brek Shea start in an attacking line-up, behind Anthony Blondell. All four attackers played against the Loons, and all four looked quite good, but just couldn’t quite manage to finish a chance. Robbo will have liked what he saw from that four, and would hope to get just a slightly better performance at home. Kei Kamara had a few chances in a brief substitute appearance, but you have to feel he is doubtful to start as he is still fully recovering from a groin injury. If he is deemed good to last at least an hour, he will likely get the start ahead of Blondell. If there’s any doubts, expect the Venezuelan. Only Robinson knows what two fullbacks will start – Sean Franklin and Brett Levis looked good in the 2-0 victory against Real Salt Lake, but disappointed in Minnesota. Does that mean a new lifeline for Jake Nerwinski and Marcel de Jong in this one? The centre back pairing is likely to remain unchanged. If Robinson does in fact select an attacking line-up, he will want his best defensive centre midfielders. Aly Ghazal has impressed defensively, as has Russell Teibert – expect to see one or both of them in the starting XI, with the Egyptian the gimme. Wilmer Cabrera’s side also lost to the Loons a couple of weeks ago, and beat LA Galaxy in a nailbiter after Memo Rodriguez headed home a stoppage-time winner last weekend. Cabrera was very happy with his side’s resilience in that match, and is unlikely to make sweeping changes. Centre-half Adolfo Machado was brought into the side for the disappointing Leonardo after Dynamo’s loss to Minnesota United, and will likely retain his place. Likewise, Eric Alexander will remain in the line-up after winning back his place from Boniek Garcia. The line-up otherwise is a familiar one, with the likes of DaMarcus Beasley, Tomas Martinez, and Mauro Manotas. Houston has quite the long injury list at the moment, but that will only affect their back four, and perhaps their ability to field a full bench. Machado and Beasley have not been bitten by the injury bug, and will likely line up with Alejandro Fuenmayor and midfielder Andrew Wenger, who will slot in at fullback out of necessity as he has done several times in his career. You could say it doesn’t quite feel like it, with it only being early May and the team sitting third in the standings, but this is a crucial moment in the Whitecaps’ season. A loss adds fuel to the fire that may see the clamour to chase Carl Robinson out of Vancouver continue to grow if he fails to right the ship. A victory could be the morale booster needed to push the Whitecaps into fighting for top spot in the conference as they did last fall, although the Real Salt Lake win didn’t seem to provide that spark. As much as the opposite seems true as of late, the Whitecaps are a quality side with a lot of good players. They have the ability to make an impact in this league, and if Carl Robinson can get his teams and tactics right a little more often than he has been, they could do some serious damage. I’ve been upset, angry, and disappointed for a week after the Minnesota United loss, but I really think this team is better than they’ve been showing us. And I think they can beat Houston Dynamo quite handily if they play like the team they are. Can they do that though?